I got in 9 holes this morning with one of my friends before he had to be at the dentist and I had to be at a meeting at Sony-Ericsson at 10 AM. We played in about 90 minutes which is great but we were dancing with the maintenance crew almost the entire way. It is hard to get in a rhythm when you are playing with people on the green or in the bunkers. It was frustrating. I shot 49 which really isn’t very good. 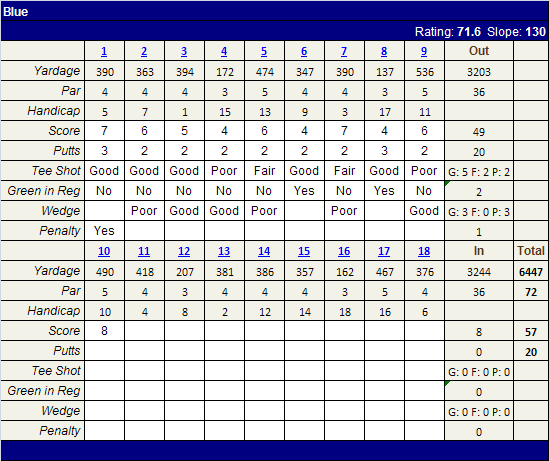 I was however, decent, although shorter than usual, off the tee with only one really bad drive (#9). My wedge play was weak today and cost me quite a few strokes (at least 5). Putted pretty well and left two right on the lip. I’d like to play 18 tomorrow but I don’t think that is going to happen.